Disclosed is an aqueous water-repellent/oil-repellent composition containing the following components (A), (B) and (C). Fluorine-containing copolymer (A): a copolymer containing a polymerizable monomer (a1) having a perfluoroalkyl group with 1-6 carbon atoms or a perfluoroalkenyl group wherein the amount of (a1) is not less than 20% by weight relative to the copolymer. Surfactant (B): a surfactant essentially containing a sorbitan ester or an alkylene oxide addition product thereof. Aqueous medium (C): a medium substantially containing water only or water and a water-soluble organic solvent. [0001 ] 本申请是分案申请，其原申请的国际申请号是PCT/JP2005/014117，国际申请日是2005年8月2日，中国国家申请号为200580027829.X，进入中国的日期为2007年2月15日，发明名称为“防水防油剂组合物”。  This application is a divisional application, international application number of its original application is PCT / JP2005 / 014117, international filing date is August 2, 2005, Chinese State Application No. 200580027829.X, date to enter China for 2007 on February 15, entitled "water and oil repellent composition." 本发明涉及一种防水防油剂组合物，更具体地说，涉及一种耐水性优异的防水防油剂组合物。  The present invention relates to a water and oil repellent composition, and more particularly, relates to an excellent water resistance and oil-repellent composition. 以往包含具有多氟代烷基的聚合性单体单元的聚合物被广泛用作防水防油剂。  conventionally comprise polymerizable monomer units having a polyfluoroalkyl group of polymers are widely used as water and oil repellent. 为了得到含有多氟代烷基的共聚物，可以使用本体聚合、溶液聚合、悬浮聚合、乳液聚合等聚合方法，其中溶液聚合、乳液聚合较常用。 In order to obtain a copolymer containing a polyfluoroalkyl group, bulk polymerization, solution polymerization, suspension polymerization, emulsion polymerization method and the like, wherein the solution polymerization, emulsion more commonly used. 这其中，从作业环境上的问题、对环境的影响等问题考虑，由乳液聚合制备的水性分散体比与由溶液聚合制备的溶剂分散体更理想。 Among these, from the problem of working environment problems, impact on the environment and other considerations, the aqueous dispersion is prepared by emulsion polymerization is more desirable than a dispersion prepared from the solvent solution polymerization. 经防水防油剂处理的纤维制品被广泛用于日常衣料、运动衣料、室内用品、户外用品、医用非织布等，随着其用途的扩大，期待进一步改善这些纤维制品的柔软性、防污性、耐水性等，以及改善这些性质的耐久性。  by the water and oil repellent-treated fiber products are widely used in everyday clothing, sports clothing, interior goods, outdoor supplies, medical and other non-woven fabric, with the expansion of its use, and look forward to further improve the flexibility of these fiber products , stain resistance, water resistance, and durability to improve these properties. 的交联性(反应性)单体的有效性等。 Crosslinkable (reactive) monomer like effectiveness. 封端异氰酸酯化合物的合用。 Blocked isocyanate ester compound in combination. 一些专利等的文献中公开了含氟(甲基)丙烯酸酯/氯乙烯(VCl)、偏二氯乙烯(VdCl)或丙烯酸烷基酯等的聚合物。  A number of patents and other literature discloses a polymer fluorine-containing (meth) acrylate / vinyl chloride (VCl), vinylidene chloride (VdCl and) alkyl acrylate or the like. 这些当中所用的含有Rf基的(甲基)丙烯酸酯的Rf基通常是长链氟代烷基(含有8个碳原子)。  Among these used Rf-yl (meth) acrylate containing a Rf group is usually a long chain fluoroalkyl group (having 8 carbon atoms). 根据最近的研究结果[EPA 报告“PREUMINARY RISK ASSESSMENT OF THEDEVELOPMENTAL TOXICITY ASSOCIATED WITH EXPOSURE TO PERFLU0R00CTAN0IC ACID ANDITS SALTS(http://www.epa.gov/opptintr/pfoa/pfoara.pdf)]等，已经逐渐明确了长链氟代烧基化合物之一的PFOA(全氟辛酸，perfluorooctanoic acid)对环境可能带来的负荷；EPA(美国环境保护厅)于2003年4月14日宣布要强化对PFOA的科学调查。另一方面，联邦公报(Federal Register) (FR Vol.68，N0.73/2003 年4 月16 日，[FRL-2303-8]，http://www.epa.gov/opptintr/pfoa/pfoafr.pdf)、2003 年4 月16 日(星期一)发布的EPA Environmental News FOR RELEASE:EPA INTENSIFIES SCIENTIFIC INVESTIGATION OFA CHEMICAL PROCESSING AID(http://www.epa.gov/opptintr/pfoa/pfoaprs.pdf)>2003年4 月14 日的EPA OPPT FACT SHEET(http://www.epa.gov/opptintr/pfoa/pfoafacts.pdf)公布了长链氟代烷基(调聚物)有通过分解或代谢生成PFOA的可能性。  According to a recent study [EPA report "PREUMINARY RISK ASSESSMENT OF THEDEVELOPMENTAL TOXICITY ASSOCIATED WITH EXPOSURE TO PERFLU0R00CTAN0IC ACID ANDITS SALTS (http://www.epa.gov/opptintr/pfoa/pfoara.pdf)], etc., have been gradually clear PFOA (perfluorooctanoic acid, perfluorooctanoic acid), one of the long-chain fluorinated compounds burn may bring environmental load; EPA (United States environmental Protection Agency) on 14 April 2003 announced to strengthen the scientific investigation of PFOA. on the other hand, Federal Register (Federal Register) (FR Vol.68, N0.73 / 2003 April 16, [FRL-2303-8], http: //www.epa.gov/opptintr/pfoa/pfoafr .pdf), released on April 16, 2003 Ri (Xing Qiyi) EPA Environmental News FOR rELEASE: EPA INTENSIFIES SCIENTIFIC INVESTIGATION OFA CHEMICAL PROCESSING AID (http://www.epa.gov/opptintr/pfoa/pfoaprs.pdf)> EPA April 14, 2003, the OPPT FACT SHEET (http://www.epa.gov/opptintr/pfoa/pfoafacts.pdf) published a long chain fluoroalkyl group (telomer) metabolic or generated by decomposition of PFOA possibilities. 为了使用与调聚物具有不同的化学骨架结构的替代化合物来降低对环境的负荷，对含有短链Rf基的聚合性单体的使用也进行了研究。  For use with a telomer compound having an alternative configuration of a different chemical backbone to reduce the impact on the environment, the use of the polymerizable monomer containing a short-chain Rf group is also studied. 作为使用含有短链Rf基的聚合性单体的现有技术，W003/062521中公开了一种防水防油剂组合物，该组合物含有具有短链Rf基的(甲基)丙烯酸酯与VCl或VdCl的共聚物以提高耐水性，但是该组合物的防水防油性和耐水性并不充分，其长期保存稳定性和对夹杂物的稳定性也不充分。  As the prior art using a polymerizable monomer having a short chain Rf group, W003 / 062521 discloses a water and oil repellent composition, which composition contains a short chain Rf group-containing (meth) acrylate, or esters with VCl VdCl improve the water resistance of the copolymer, but the composition of the water and oil repellency and water resistance is not sufficient, the long-term storage stability and stability of the inclusions is not sufficient. 另外，W002/083809、W004/035708中也记载了使用含有短链Rf基的聚合性单体的例子，但是其防水防油性和耐水性不充分。 Further, W002 / 083809, in W004 / 035708 also describes an example using a polymerizable monomer having a short chain Rf group, but it water and oil repellency and water resistance is not sufficient. 根据上述文献，已知在具有含有Rf基的丙烯酸酯的聚合单元的聚合物中，若Rf基的链长变短，则防水防油性能下降。  According to the above literature, it is known having polymerized units of an acrylate-containing group Rf is, when the chain length of the Rf group is shortened, the water and oil repellency decreases. 另外发明人的研究中也发现，若单纯缩短Rf基的链长，则在诸如邦迪斯门试验(Bundesmann test)那样的降雨耐久性试验中，流出水量有显著增加(耐水性下降)的现象。 Further studies by the inventors also found that, if simply shortening the chain length of the Rf group, such as the Bundesmann test (Bundesmann test) as rain endurance test, the amount of water flowing out of a marked increase (decrease water resistance) phenomenon . 也就是说，现有技术中，采用具有不同于调聚物的化学骨架结构的替代化合物不能得到在满足降低对环境负荷的目的的同时还满足高度耐水性的防水防油剂水性分散液。  That is, the prior art, the use of alternative compounds having a chemical structure different from the skeleton can not be obtained telomer meet the purpose of reducing environmental load, while also satisfying the water resistance of the highly water and oil repellent aqueous dispersion liquid. 本发明的目的在于提供一种能够对纤维基材赋予高度耐水性的组合物，所述组合物中使用具有不同于调聚物的化学骨架结构的化合物，该化合物在环境方面所造成的问题较少。  The object of the present invention is to provide a highly capable of imparting water resistance to the fiber base material composition, the combination of a compound having a structure different chemical backbone of telomer was used, the resulting compound in the environment fewer problems. 本发明提供一种防水防油剂水性组合物，该组合物包含下述的含氟共聚物(A)、表面活性剂(B)以及水性介质(C)。  The present invention provides a water and oil repellent aqueous composition, the composition comprising the fluorinated copolymer (A), the surfactant (B) and an aqueous medium (C). 所述(a3)为含有极性基团或反应性基团的聚合性单体。 The (a3) ​​ polymerizable monomer containing a polar group or a reactive group. 所述表面活性剂(B)为非离子型表面活性剂(bl)，该非离子型表面活性剂(bl)是脱水山梨醇酯和/或其环氧化物加成物。  The surfactant (B) a non-ionic surfactant (bl), the nonionic surfactant (BL) is a sorbitan ester and / or its alkylene oxide adduct. 所述水性介质(C)为仅含有水的介质，或为含有水和有机溶剂的混合物的介质。  The aqueous medium (C) containing the aqueous medium as the medium only, or a mixture comprising water and an organic solvent. 本发明还提供一种防水防油剂水性混合物，所述混合物含有上述的防水防油剂水性组合物和交联剂。  The present invention also provides a water and oil repellent aqueous mixture, said mixture comprising the above-described aqueous water and oil repellent composition and a crosslinking agent. 通过本发明，能够对纤维基材赋予优异的防水防油性，特别是能赋予其高度的耐水性，并且所述纤维基材的稳定性(机械稳定性、化学稳定性、长期保存性)良好。  By the present invention, it is possible to impart excellent water and oil repellency to fibrous substrates, especially to impart a high degree of water resistance, and stability of the fibrous substrate (mechanical stability, chemical stability, long-term storage )good. 用于本发明的聚合性单体(al)为具有全氟代烷基或全氟代链烯基以及聚合性不饱和基团的化合物。  The polymerizable monomer (Al) used in the present invention is a perfluoroalkyl group or a perfluoro alkenyl group and a polymerizable unsaturated compound. 全氟代烷基或全氟代链烯基的碳原子数的上限为6，例如为5，特别是为4。 The upper limit of the number of carbon atoms,  perfluoroalkyl or perfluorinated alkenyl group having 6, for example 5, in particular 4. 全氟代烷基的例子是-CF3、-CF2CF3、-CF2CF2CF3、-CF (CF3) 2、-CF2CF2CF2CF3、-CF2CF (CF3) 2、_C (CF3) 3、-(CF2) 4CF3、- (CF2) 2CF (CF3) 2、CF2C (CF3) 3、-CF (CF3) CF2CF2CF3、- (CF2) 5CF3、- (CF2) 3CF (CF3) 2 等。 Examples of the perfluoroalkyl is -CF3, -CF2CF3, -CF2CF2CF3, -CF (CF3) 2, -CF2CF2CF2CF3, -CF2CF (CF3) 2, _C (CF3) 3, - (CF2) 4CF3, - (CF2) 2CF (CF3) 2, CF2C (CF3) 3, -CF (CF3) CF2CF2CF3, - (CF2) 5CF3, - (CF2) 3CF (CF3) 2 and the like. 全氟代链烯基的例子是-CF = CF (CF3)、-CF=C (CF3) 2、-C (CF3) =CF (CF (CF3) 2)、-C (CF2CF3) =C (CF3) 2 等。 Examples of perfluorinated alkenyl group is -CF = CF (CF3), - CF = C (CF3) 2, -C (CF3) = CF (CF (CF3) 2), - C (CF2CF3) = C (CF3 ) 2 and so on. 聚合性不饱和基团可以是丙烯酸酯基(-0C (=0) -CH=CH2)、甲基丙烯酸酯基(-0C (=0) -C (CH3) =CH2)、乙烯基(-CH=CH2)、亚乙烯基(-CH=CH-)、乙烯叉基(=C=CH2)、α 取代丙烯酸酯基(-0C (=0)-CX=CH2 [X为卤素原子(例如氟原子、氯原子、溴原子、碘原子)XFX1X2基(X1和X2是氢原子、氟原子、氯原子、溴原子或碘原子)(例如CF3)、氰基、碳原子为I〜21的直链状或支链状的氟代烷基、取代或无取代的苄基、取代或无取代的苯基])等。  The polymerizable unsaturated group may be an acrylate group (-0C (= 0) -CH = CH2), a methacrylate group (-0C (= 0) -C (CH3) = CH2), vinyl (-CH = CH2), vinylene (-CH = CH-), vinylidene (= C = CH2), α-substituted acrylate ester (-0C (= 0) -CX = CH2 [X is a halogen atom ( e.g. fluorine atom, chlorine atom, bromine atom, iodine atom) XFX1X2 group (X1 and X2 is a hydrogen atom, a fluorine atom, a chlorine atom, a bromine atom or an iodine atom) (e.g. CF3), a cyano group, the carbon atom I~21 fluoroalkyl group linear or branched, substituted or unsubstituted benzyl group, a substituted or unsubstituted phenyl group]) and the like. 聚合性单体(al)例如为下式(11)的化合物。  For example a compound of the formula (11) is a polymerizable monomer (al). n:l 或2。  n: l or 2. 式(11)中，二价的有机基团(A基)可以是酯基(_C(=0)0_)、酰胺基、亚烷基(碳原子数I〜10)、醚基(-0-)、-CH2CH (OX) CH2-(X为氢或碳原子数为I〜5的酰基)、以及上述基团的组合等。  Formula (11), the divalent organic group (A group) may be an ester group (_C (= 0) 0_), an amide group, alkylene (carbon atoms I~10), an ether group ( -0 -), - CH2CH (OX) CH2- (X is a hydrogen or an acyl group having a carbon number of I~5), and combinations of the foregoing groups and the like. 聚合性单体(al)可以是下式(11 一I)〜(11 一7)的化合物。 Compound  The polymerizable monomer (Al) may be a formula (a 11 I) ~ (11 a 7). R6:碳原子数为I〜10的亚烷基或-R7-Nd?1) CO-O-R2-；  R6: carbon atoms or an alkylene group I~10 -R7-Nd 1) CO-O-R2-;? 聚合性单体(al)优选为丙烯酸酯，其α位可以被取代。  The polymerizable monomer (Al) is preferably an acrylate, which may be substituted α position. 式(12)中，二价的有机基(A基)可以是酯基(_C(=0)0_或-0C(=0)_)、酰胺基、醚基(-0-)等。 In the  Formula (12), the divalent organic group (A group) may be an ester group (_C (= 0) 0_ or -0C (= 0) _), an amide group, an ether group (-0-) Wait. 聚合性不饱和基(B基)可以是丙烯酸酯基(-0C(=0)-CH=CH2)、甲基丙烯酸酯基(-0C (=0)-C (CH3) =CH2)、乙烯基(-CH=CH2)、亚乙烯基(-CH=CH-)、乙烯叉基(=C=CH2)、α取代丙烯酸酯基(-0C (=0) -CX=CH2 (X为卤素(例如氟、氯或溴)、CF3或CN))等。 Polymerizable unsaturated group (B group) may be an acrylate group (-0C (= 0) -CH = CH2), a methacrylate group (-0C (= 0) -C (CH3) = CH2), vinyl (-CH = CH2), vinylene (-CH = CH-), vinylidene (= C = CH2), α-substituted acrylate ester (-0C (= 0) -CX = CH2 (X is a halogen (e.g. fluorine, chlorine or bromine), CF3, or the CN)) and the like. 进一步，聚合性单体(a2)可以是下式(12 — I)〜(12 — 5)的化合物。  Further, the polymerizable monomer (a2) may be a compound of the formula - - (512) of the (12 I) ~. R4:H、碳原子数为I〜10的烷基或环烷基。  R4: H, carbon atoms in the alkyl or cycloalkyl group I~10. 聚合性单体(a2)的具体实例为诸如(甲基)丙烯酸十六烷基酯、(甲基)丙烯酸硬脂酯、(甲基)丙烯酸二十二酯等碳原子数为15以上的烷基的(甲基)丙烯酸酯类；诸如(甲基)丙烯酸环己酯、(甲基)丙烯酸异冰片酯、(甲基)丙烯酸三环癸基酯等碳原子数为6以上的脂环式烷基或脂环式烯基的(甲基)丙烯酸酯类；氯乙烯；硬脂酸乙烯酯等的碳原子数15以上的脂肪酸的乙烯基酯类；诸如N-甲基马来亚酰胺、N-环己基马来亚酰胺等N-烧基马来亚酰胺类。  Specific examples of the polymerizable monomer (a2) of carbon atoms, such as (meth) acrylate, cetyl (meth) acrylate, stearyl (meth) acrylate, lauryl acrylate and the like 15 or more (meth) acrylic acid alkyl esters; such as (meth) acrylate, (meth) acrylate, carbon atoms (meth) acrylate, tricyclo decyl ester having 6 or more (meth) acrylate or an alicyclic alkyl group, an alicyclic alkenyl; chloride; stearic carbon atoms, vinyl esters such as 15 or more vinyl esters of fatty acids; such as N- methylmaleimide imide, N- cyclohexyl maleimide and the like burn-yl N- maleimide class. 聚合性单体(a2)的其他的具体实例为甲基丙烯酸甲酯、丙烯腈、苯乙烯、烷基乙烯醚、α-烯烃等。  Other specific examples of the polymerizable monomer (a2) are methyl methacrylate, acrylonitrile, styrene, alkyl vinyl ether, alpha] -olefin and the like. 对于聚合性单体(a2)，优选由该聚合性单体形成的均聚物的玻璃化转变温度(Tg)为50°C以上，例如60°C以上，特别是70°C以上，并且/或者熔点(Tm)为30°C以上，例如40°C以上，特别是50°C以上。  For the polymerizable monomer (a2), preferably a glass homopolymer formed from the polymerizable monomer transition temperature (Tg) less than 50 ° C, for example above 60 ° C, especially above 70 ° C The above and / or melting point (Tm) of 30 ° C, for example above 40 ° C, especially 50 ° C or more. Tg和/或Tm在此范围内的情况下，可以得到高防水防油性能。 Tg and / or Tm in the case within this range, it is possible to obtain high water and oil repellency. 优选Tg的上限为200°C且Tm的上限为200°C。 The upper limit of Tg is preferably 200 ° C and an upper limit Tm of 200 ° C.
 根据需要，用于本发明的聚合性单体(a3)含有极性基团和/或反应性基团。  According to need, a polymerizable monomer (a3) ​​used in the present invention contains a polar group and / or reactive groups. 极性基团的实例为羟基(-0H)、聚氧亚烷基、氨基(-NR2 (R是氢或碳原子数为I〜4的烷基))、N-羟甲基(-NHCH2OH)、酰胺基、羧基(-C00H)、卤素基团等。  Examples of the polar group is a hydroxyl (-0H), polyoxyalkylene alkyl, amino (-NR2 (R is hydrogen or a carbon atoms I~4 alkyl)), N-methylol ( -NHCH2OH), an amide group, a carboxyl group (-C00H), a halogen group and the like. 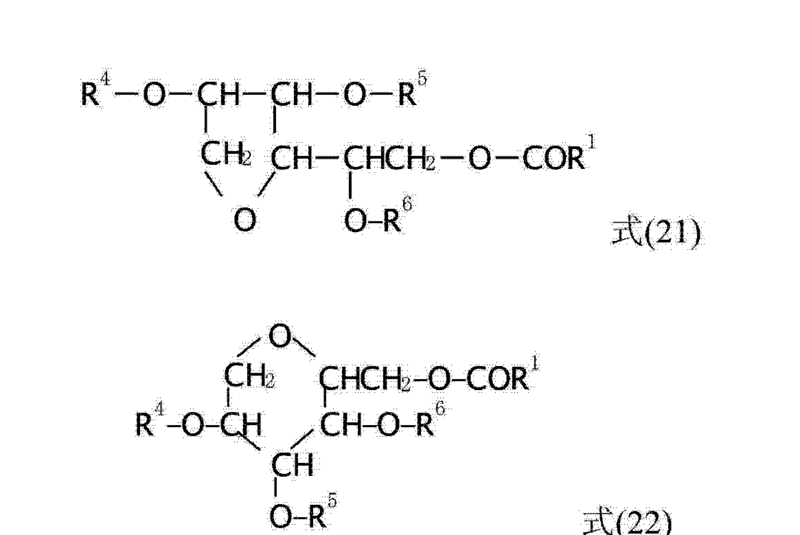 反应性基团的实例为环氧基、封端化异氰酸酯基等。 Examples  reactive groups are epoxy, blocked isocyanate group. 聚合性单体(a3)的具体实例为(甲基)丙烯酸3-氯-2-羟基丙酯、N-羟甲基(甲基)丙烯酰胺、(甲基)丙烯酸2-羟基乙酯、(甲基)丙烯酸2-羟基丙酯、氯甲基苯乙烯、(甲基)丙烯酸缩水甘油酯、双丙酮丙烯酰胺、(甲基)丙烯酸单甘油酯、(甲基)丙烯酸聚氧化烯基二醇单酯、含有封端化异氰酸酯基的(甲基)丙烯酸酯等。  Specific examples of the polymerizable monomer (a3) ​​is a (meth) acrylate, 3-chloro-2-hydroxypropyl methacrylate, N- methylol (meth) acrylamide, (meth) acrylate, 2-hydroxyethyl ester, (meth) acrylate, 2-hydroxypropyl acrylate, chloromethylstyrene, (meth) acrylate, diacetone acrylamide, (meth) acrylate, glycerol mono (meth) acrylate, polyoxyalkylene glycol monoesters, comprising the blocked isocyanate group-containing (meth) acrylate. 对于共聚物㈧，除了(al)、(a2)、(a3)之外，还可以含有能够与(al)共聚合的聚合性单体，该能够与(al)共聚合的聚合性单体例如为(甲基)丙烯酸丁酯、(甲基)丙烯酸2-乙基己酯、(甲基)丙烯酸月桂酯等碳原子数为14以下的烷基的(甲基)丙烯酸酯、偏二氯乙烯、丁二烯、氯丁二烯、异戊二烯、醋酸乙烯酯、烷基乙烯基醚等。  For copolymers (viii), except that (al), (a2), (a3), but also it may contain a polymerizable monomer can be copolymerized with (Al) polymerization, which is capable of (Al) copolymerizing a polymerizable monomers such as (meth) acrylate, carbon atoms (meth) acrylate, 2-ethylhexyl (meth) acrylate, lauryl acrylate and the like is 14 or less alkyl (meth) acrylates, vinylidene vinylidene chloride, butadiene, chloroprene, isoprene, vinyl acetate, alkyl vinyl ether. 共聚物(A)可以是均聚物或2元共聚物，但优选是3元以上的共聚物。  copolymer (A) may be a homopolymer or a binary copolymer, but is preferably a copolymer of 3 or more. 重量％〜10重量％。 Wt% ~ 10 wt%. 用于本发明的表面活性剂(B)以非离子型表面活性剂(bl)脱水山梨醇酯或其环氧化合物加成物作为其必须成分。  a surface-active agent (B) is a non-ionic surfactant (BL) sorbitan esters or alkylene oxide adducts of compounds of the present invention as an essential component thereof. 表面活性剂(B)还可以包含(b2)其他非离子型表面活性剂和/或(b3)阳离子型表面活性剂。  Surfactant (B) may further comprise (b2) other non-ionic surfactant and / or (b3) a cationic surfactant. 脱水山梨醇酯是羧酸(碳原子数为I〜30)与脱水山梨醇的酯。  sorbitan esters of carboxylic acids (number of carbon atoms I~30) and sorbitan esters. 脱水山梨醇酯中的羧酸的摩尔数为1、2或3。 The number of moles of the carboxylic acid ester of sorbitan is 1, 2 or 3. 优选为单羧酸酯。 It is preferably a monocarboxylic acid ester. 脱水山梨醇酯的环氧化物加成物中，环氧化物优选是环氧乙烷或环氧丙烷。  sorbitan esters of alkylene oxide adduct, the epoxide is preferably ethylene oxide or propylene oxide. 环氧化物加成物中，环氧化物的加成摩尔数可以为I〜50，特别可以为I〜30。 Alkylene oxide adducts, alkylene oxide addition mole number may be I~50, in particular, may be I~30. 上述式中，R1是碳原子数为I〜22的烷基或碳原子数为2〜22的链烯基；R4、R5、R6是H、R1CO-, -(CH2CH2O)P-(R20) q-R3 (R2是碳原子数为3以上的亚烷基；R3为氢原子、碳原子数为I〜22的烧基或碳原子数为2〜22的链烯基；p为2以上的数；q为O或I以上的数。  the above formula, R1 is an alkyl group carbon atoms or an I~22 carbon atom of the alkenyl group having 2~22; R4, R5, R6 are H, R1CO-, - (CH2CH2O) P- ( R20) q-R3 (R2 is a number of 3 or more carbon atoms alkylene group; R3 is a hydrogen atom, carbon atoms or a group number I~22 burning of carbon atoms of the alkenyl group having 2~22; p is 2 the number above; Q is O or I, more number. 以式(21)或(22)表示的非离子型表面活性剂(bl)的具体实例是单月桂酸脱水山梨醇酯、单硬脂酸脱水山梨醇酯、单棕榈酸脱水山梨醇酯、单油酸脱水山梨醇酯、倍半硬脂酸脱水山梨醇酯、三硬脂酸脱水山梨醇酯、单月桂酸聚氧乙烯脱水山梨醇酯、单棕榈酸聚氧乙烯脱水山梨醇酯、单硬脂酸聚氧乙烯脱水山梨醇酯、单油酸聚氧乙烯脱水山梨醇酯和三硬脂酸聚氧乙烯脱水山梨醇酯等。 Specific examples of the nonionic surfactant (BL) is represented by  In the formula (21) or (22) is sorbitan monolaurate, sorbitan monostearate, sorbitan monopalmitate esters, sorbitan ester monooleate, sesquioleate, sorbitan monostearate, sorbitan tristearate, monolaurate polyoxyethylene sorbitan esters, polyoxyethylene monopalmitate sorbitan esters monostearate, polyoxyethylene sorbitan esters, polyoxyethylene monooleate, sorbitan tristearate and polyoxyethylene sorbitan ester. 作为其他非离子型表面活性剂(b2)，可以是直链状和/或支链状的饱和及/或不饱和脂肪族基的环氧化物加成物、直链状和/或支链状饱和及/或不饱和脂肪酸的聚亚烷基二醇酯、聚氧乙烯(POE)/聚氧丙烯(POP)共聚物(无规共聚物或嵌段共聚物)、乙炔二醇的环氧化物加成物等。  As another non-ionic surfactant (B2), may be linear and / or branched, saturated and / or unsaturated aliphatic group-alkylene oxide adduct, linear and / or branched-chain saturated and / or unsaturated fatty acid polyalkylene glycol esters, polyoxyethylene (POE) / polyoxypropylene (POP) copolymers (random or block copolymer), acetylene glycol alkylene oxide adducts. 其中，优选环氧化物加成部分和聚亚烷基二醇部分的结构是聚氧乙烯(POE)或聚氧丙烯(POP)或者Ρ0Ε/Ρ0Ρ共聚物(无规共聚物或嵌段共聚物)。 Wherein, the addition moiety and the polyalkylene glycol structure is preferably an epoxide moiety is polyoxyethylene (POE) or polyoxypropylene (POP) or Ρ0Ε / Ρ0Ρ copolymers (random or block copolymer) . 另外，从环境上的问题(生物降解性、环境激素等)方面考虑，其他非离子型表面活性剂(b2)优选结构上不含芳香族基。  Further, from the viewpoint of the problem (a biodegradable, environmental hormones and the like) on the environment, the structure is preferably an aromatic group free of additional non-ionic surfactant (b2). 其他非离子型表面活性剂(b2)可以是式(23)表示的表面活性剂。  Other non-ionic surfactant (b2) may be of formula (23) represented by the surfactant. 上述式中，R1是碳原子数为I〜22的烷基或碳原子数为2〜22的链烯基；R2是碳原子数为3以上(例如3〜10)的亚烷基；R3为氢原子、碳原子数为I〜22的烷基或碳原子数为2〜22的链烯基；p为2以上的数；q为O或I以上的数。  the above formula, R1 is an alkyl group having a carbon number of carbon atoms or an I~22 alkenyl group of 2~22; R2 is 3 or more carbon atoms (e.g. 3~10) alkylene ; R3 is a hydrogen atom, an alkyl group carbon atoms or an I~22 carbon atoms, an alkenyl group of 2~22; p is 2 or more numbers; Q is O or I or more numbers. R2的示例为亚丙基和亚丁基。 Example  R2 is ethylene, propylene and butylene. C16H33O- (CH2CH2O) ρ- (C3H6O) ,-C12H25. i SO-C13H27O- (CH2CH2O) ρ- (C3H6O) qH 等。  C16H33O- (CH2CH2O) ρ- (C3H6O), -C12H25. i SO-C13H27O- (CH2CH2O) ρ- (C3H6O) qH like. 上述式中，ρ和q与上述意义相同。  In the above formula, ρ and q are as defined above. 此外，非离子型表面活性剂(b2)可以为以下式(24)表示的表面活性剂。  In addition, non-ionic surfactant (b2) may be a surfactant (24) represented by the following formula. 上述式中，R1是碳原子数为I〜22的烷基或碳原子数为2〜22的链烯基；R2是碳原子数为3以上(例如3〜10)的亚烷基；R7为H、R1CO^或R3 (R3是碳原子数为I〜22的烷基或碳原子数为2〜22的链烯基)；p为2以上的数；q为O或I以上的数。  the above formula, R1 is an alkyl group having a carbon number of carbon atoms or an I~22 alkenyl group of 2~22; R2 is 3 or more carbon atoms (e.g. 3~10) alkylene ; R7 is H, R1CO ^ or R3 (R3 carbon atoms or an alkyl group having a carbon number of 2~22 I~22 alkenyl); P is the number 2 or more; Q is O or I, more number. C11H23COO- (CH2CH2O) p_H 等。  C11H23COO- (CH2CH2O) p_H like. 上述式中，p和q与上述意义相同。  In the above formula, p and q are as defined above. 还可以并用上述以外的其他非离子型表面活性剂。  and may also be other nonionic surfactants other than the active agent. ρ 为I 或2, q 为2 或3,且p+q=4。  ρ is I or 2, q is 2 or 3 and p + q = 4. R1可以具有12〜50个碳原子，例如具有12〜30个碳原子。  R1 may have 12~50 carbon atoms, e.g. having 12~30 carbon atoms. 表面活性剂(B)中，非离子型表面活性剂(bl)相对于表面活性剂(B)的比例为I重量％〜100重量％，例如为5重量％〜100重量％。  Surfactant (B), the nonionic surfactant (BL) with respect to the ratio of surfactant (B) is I wt% ~ 100% by weight, for example 5 wt% ~ 100% by weight. 其他非离子型表面活性剂(b2)相对于100重量份非尚子型表面活性剂(bl)的量可以为O〜1000重量份，例如为5重量份〜500重量份。 Other non-ionic surfactant (b2) with respect to an amount of 100 parts by weight of the non Naoko surfactant (BL) may be as O~1000 parts by weight, for example 5 parts by weight of ~ 500 parts by weight. 相对于非离子型表面活性剂(bl)和(b2)的合计量100重量份，阳离子型表面活性剂(b3)的量可以为O重量份〜500重量份，例如为I重量份〜300重量份。 With respect to the nonionic surfactant (BL) and (b2) in an amount of 100 parts by weight of the total amount of the cationic surfactant (b3) may be O ~ 500 parts by weight parts by weight, for example, I ~ 300 parts by weight by weight copies. 表面活性剂(B)的合计使用量相对于100重量份的聚合性单体(A)可以为0.1重量份〜20重量份,优选为I重量份〜15重量份。  The amount of total surfactant (B) with respect to 100 parts by weight of the polymerizable monomer (A) may ~ 20 parts by weight to 0.1 parts by weight, preferably I ~ 15 parts by weight parts by weight. 用于本发明的水性介质(C)可以仅含有水，也可以是水和有机溶剂的混合物。  The aqueous medium (C) of the present invention may contain water only, or may be a mixture of water and an organic solvent. 水性介质(C)可以实质上仅含有水(水的含量至少为98重量％，特别是至少为99重量％)。 The aqueous medium (C) may contain substantially only water (water content of at least 98% by weight, in particular at least 99% by weight). 有机溶剂优选为能够与水混合的有机溶剂。  The organic solvent is preferably water, can be mixed with an organic solvent. 有机溶剂的例子可以举出乙二醇、丙二醇、二丙二醇、三丙二醇、二丙二醇单甲基醚、丙酮、丁酮、乙醇、异丙醇等。 Examples of organic solvents include ethylene glycol, propylene glycol, dipropylene glycol, tripropylene glycol, dipropylene glycol monomethyl ether, acetone, methyl ethyl ketone, ethanol, isopropanol and the like. 使用有机溶剂的情况下，考虑到引火性、异味、对环境的负荷等，优选尽量少量(相对于共聚物(A)例如为40重量％以下，优选为30重量％以下)地使用高引火点(例如为20°C以上，优选为50°C以上)的溶剂。  the case of using an organic solvent, taking into account inflammability, odor, environmental load and the like, preferably as small amounts (relative to the copolymer (A) is, for example 40 wt% or less, preferably 30 wt% or less) used a high flash point (e.g. less than 20 ° C, preferably 50 ° C) a solvent. 重量％〜80重量％、例如为0.02重量％〜50重量％的量。 Wt% ~ 80 wt%, in an amount of 0.02 wt% ~ 50 wt%, for example. 本发明的防水防油剂水性组合物可以通过以下制造方法进行制造:将聚合性单体(al)、(a2)、(a3)、表面活性剂(B)、水性介质(C)进行投料、乳化，然后进行聚合。  The aqueous water and oil repellent composition of the present invention can be produced by the following production method: The polymerizable monomer (al), (a2), (a3), the surfactant (B), the aqueous medium (C) for feeding, emulsified, followed by polymerization. 根据需要可以采用滴加聚合、种子聚合等方法。 The required dropping polymerization, seed polymerization method can be employed. 另外，还可以在使用(bl)以外的表面活性剂进行乳液聚合后添加非离子性表面活性剂(bl)来进行制造。 Further, a surfactant may be used (BL) other than add nonionic surfactant (BL) to be produced after the emulsion polymerization. 聚合性单体的一部分为气态单体的时候，可以通过以下方法制造:将该气态单体以外的物质进行投料、乳化，然后在聚合前将气态单体进行投料、聚合。  polymerizable monomer when part of gaseous monomer, can be produced by the following method: a substance other than the gaseous monomer feed, emulsification, and then the gaseous monomer feed before polymerization, the polymerization. 在进行乳化的情况下，根据需要，优选利用均质混合器(homomixer)等进行预分散后，使用超声波乳化机或高压均质器进行乳化，以使乳化后的聚合性单体的粒径为0.3 μ m以下。 After the  case of performing the emulsification, according to need, preferably using a homomixer (HOMOMIXER) like pre-dispersed using an ultrasonic emulsifying machine or a high pressure homogenizer to emulsify the polymerizable monomer so that the emulsified a particle size of 0.3 μ m or less. 在聚合时，可以使用用于调整共聚合物的分子量的链转移剂和聚合引发剂。  In the polymerization, a chain transfer agent may be used to adjust the molecular weight of the copolymer and a polymerization initiator. 此外，作为聚合引发剂，可以举出2，2' -偶氮二异丁腈、2，2' -偶氮二(2_脒基丙烷)•二盐酸盐、2，2' -偶氮二[2-(2-咪唑啉-2-基)丙烷]•二盐酸盐等偶氮类引发剂，叔丁基过氧化新戊酸酯、叔丁基过氧化新癸酸酯等过氧化物引发剂、氧化还原类引发剂等。  Further, as the polymerization initiator include 2,2 '- azobisisobutyronitrile, 2,2' - azobis (2_ amidinopropane) • dihydrochloride, 2,2 ' - azobis [2- (2-imidazolin-2-yl) propane] dihydrochloride • azo initiators, t-butylperoxy pivalate, t-butylperoxy neodecanoate and other peroxide initiators, redox initiators and the like. 在所得到的防水防油剂组合物中，从沉降稳定性的观点出发，分散树脂的粒径优选为0.25 μ m以下,例如为0.15 μ m以下。 Particle size  In the obtained water and oil repellent composition, from the viewpoint of sedimentation stability of the dispersion resin is preferably 0.25 μ m or less, for example, 0.15 μ m or less. 在本发明的防水防油剂组合物中，根据需要，可以进一步包含交联剂、其他聚合物、其他防水剂、防油剂、防污剂、防虫剂、阻燃剂、抗静电剂、染料稳定剂、防皱剂、防缩剂、质地加工剂、柔软整理剂、消泡剂等的添加剂等。  In the water and oil repellent composition of the present invention, if necessary, may further comprise a crosslinking agent, other polymers, other water repellent, oil repellent, antifouling agents, insect repellents, flame retardants, antistatic agent, dye stabilizer, anti-wrinkle agents, anti-shrinking agents, texture processing agent, a softening agent, antifoaming additives. 为了改善耐水性，优选并用交联剂。  In order to improve the water resistance, and preferably a crosslinking agent. 作为交联剂，可以举出以封端化异氰酸酯化合物、蜜胺树脂化合物、乙二醛类树脂化合物、尿素类树脂化合物、交联型单体(N-羟甲基丙烯酰胺、甲基丙烯酸2-异氰酸酯基乙酯的封端化物等)为必须聚合单元的聚合物等，优选封端化异氰酸酯化合物或蜜胺树脂化合物。  As the crosslinking agent, to include blocked isocyanate compounds, melamine resin compound, a glyoxal-based resin compound, a urea-based resin compound, a crosslinking monomer (N- methylol acrylamide, methyl yl acrylate, 2-ethyl isocyanate terminated compound, etc.) to be polymerized polymer units and the like, preferably blocked isocyanate compound or melamine resin compound. 此处，封端化异氰酸酯化合物为不具有聚合性不饱和基团的化合物，优选为用封端剂将多异氰酸酯的异氰酸酯基封端的结构的化合物。 Here, the blocked isocyanate compound is a compound having no polymerizable unsaturated group, with a capping agent compounds of the isocyanate groups of the blocked polyisocyanate preferably. 作为蜜胺树脂化合物，可以举出三羟甲基蜜胺、六羟甲基蜜胺等。 As the melamine resin compounds include trimethylol melamine, hexamethylol melamine and the like. 通过使本发明的组合物(特别是含氟共聚物)附着到被处理物上，对被处理物进行处理。  attached to the object to be treated by the composition of the present invention (particularly a fluorine-containing copolymer), was treated to be processed. 将本发明的组合物施用到被处理物上时，优选利用涂布、浸溃、喷涂、填料、辊涂或这些方法的组合。  The compositions of the present invention is applied to the object to be treated, the composition preferably by coating, dipping, spray coating, a filler, or combinations of these methods of roll coating. 一般地，将被处理物浸溃到防水防油剂水性组合物中，利用轧辊除去多余的液体，然后进行干燥并且根据需要进行热固化。 Generally, to be treated was impregnated into water and oil repellent aqueous composition, using a roller to remove excess liquid, then dried and thermally cured as required. 将本发明的组合物施用至被处理物时，其处理量优选为使共聚物(A)为被处理物的约0.01重量％〜I重量％。 The compositions of the invention when administered to be processed, the processing thereof is preferably such that the amount of the copolymer (A) is from about 0.01 wt% ~I object to be processed wt%. 下面给出实施例，对本发明进行具体的说明。  The following examples are given, the present invention will be specifically described. 实施例中，若未特别指出，则“％”和“份”分别表示“重量％”和“重量份”。 Embodiment, if not otherwise indicated, the "%" and "parts" denote "% by weight" and "parts by weight." 在实施例中，对评价的各特性进行如下测定。  In an embodiment, the evaluation of various properties were measured as follows. 用水稀释聚合物分散液以使固形物浓度为0.6重量％，制备处理液。  polymer dispersion was diluted with water so that the solid concentration of 0.6 wt% to prepare a treatment liquid. 将尼龙塔夫绸布(Kanebo制f ★ Λ — 3、尼龙6、藏青染色布)(Ny)和聚酯/棉混纺布(斜纹织物、未染色、丝光纱加工)(PET/C)浸溃到处理液中，用轧液机挤压，使纤维吸液率(wet pickup)为40%(尼龙)、60% (聚酯/棉混纺布)，于100°C干燥2分钟，再于160°C热处理I分钟后，评价处理布的防水防油性。 Nylon taffeta cloth (manufactured by Kanebo f ★ Λ - 3, nylon 6, dark blue dyed fabric) (Ny) and polyester / cotton blend fabric (twill weave, undyed, silk yarn processing) (PET / C) Impregnated the treatment liquid, squeezed with a mangle the fibers of the absorbent (wet pickup) 40% (nylon), 60% (polyester / cotton blended fabric), dried at 100 ° C 2 minutes and then at 160 after the heat treatment ° C I min, water and oil repellency evaluation processing cloth. 以JIS-L-1092的喷雾法的防水性N0. (参照下述表I)表示防水性。  In waterproof N0 JIS-L-1092 Spray method. (See Table I) is waterproof. 按照AATCC-TM118在试验布上的两个地方滴加数滴下述表2所示的试验溶液，观察30秒后的浸透状态，以未出现浸透的试验溶液所赋予的防油性的最高点作为防油性。  2 drops of a test solution shown in AATCC-TM118 Table according to the number of dropped two places on the test cloth, the state of penetration was observed after 30 seconds at the highest test solution saturated oil repellency imparted not appear point as the oil repellency. 用水稀释聚合物分散液以使固形物浓度为0.6重量％，制备处理液。  polymer dispersion was diluted with water so that the solid concentration of 0.6 wt% to prepare a treatment liquid. 将聚酯/棉混纺布(斜纹织物、未染色、丝光纱加工)(PET/C)浸溃到处理液中，用轧液机挤压，使纤维吸液率(wet pickup)为60% (聚酯/棉混纺布)，于100°C干燥2分钟，再于160°C热处理I分钟后，评价该处理布的流出水量。 The polyester / cotton blend fabric (twill weave, undyed, silk yarn processing) (PET / C) impregnated into the treatment liquid, squeezed with a mangle the fibers of the absorbent (wet pickup) 60% ( polyester / cotton blended fabric), dried at 100 ° C 2 min, and then heat-treated at 160 ° C after I minute, the water flowing out of the evaluation process cloth. 对于流出水量，基于DIN53888的邦迪斯门试验法测定10分钟后的流出水量(流出水量，透过处理布的水量)。  For effluent water, effluent water was measured 10 minutes after the Bundesmann test method DIN53888 based (water flows through the water treated cloth). 流出水量少是理想的。 Outflow of water is less ideal. 将固形物为30质量％的防水防油剂组合物于40°C静置I个月后，观察沉降的发生。  After a solids content of 30% by mass of the water and oil repellent composition was allowed to stand for I month at 40 ° C, sedimentation occurred was observed. 优选没有沉降物。 Preferably no sediment. 将防水防油剂组合物用自来水稀释到固形物浓度为0.2质量％，用均质混合器于3000rpm搅拌10分钟后，将出现的浮渣过滤到黑色棉布上。  The water and oil repellent composition is diluted with tap water to a solid content concentration of 0.2 mass%, stirring with a homomixer at 3000rpm for 10 minutes, the scum appearing on the black cloth filter. 优选没有浮渣。 Preferably no scum. 0.006重量％的分散染料，充分混合后观察凝集物的出现。 0.006% by weight of disperse dye, sufficiently mixed agglutination was observed. 优选没有凝集物。 Preferably no agglutinates. 投入 38.1g 的C4F9CH2CH2OCOC (CH3) =CH2 (以下记做9FMA)、14.6g 的丙烯酸硬脂酯(以下记做StA)、1.2g的N-羟甲基丙烯酰胺(以下记做N-MAM)、0.6g的甲基丙烯酸3-氯-2-羟基丙酯(以下记做CHPMA)、0.Sg的聚氧乙烯-聚氧丙烯烷基醚(非离子型表面活性剂，HLB值12)(日本油脂(株)制造EBD-12)、3.0g的聚氧乙烯脱水山梨醇单月桂酸酯(HLB值为17)(日本油脂(株)制造LT-221)、1.4g的十六烷基三甲基氯化铵(STMAC)、16g的三丙二醇、70g的离子交换水、0.03g的十二烷基硫醇、0.12g的醋酸。  Into 38.1g of C4F9CH2CH2OCOC (CH3) = CH2 (hereinafter denoted 9FMA), 14.6g of stearyl acrylate (hereinafter denoted StA), 1.2g of N- methylol acrylamide (hereinafter denoted N- MAM), 0.6g methacrylic acid 3-chloro-2-hydroxypropyl ester (hereinafter denoted CHPMA), polyoxyethylene 0.Sg - a polyoxypropylene alkyl ether (nonionic surfactant, HLB value 12 ) (Nippon oil and fats (Corp.) EBD-12), 3.0g of polyoxyethylene sorbitan monolaurate (HLB value of 17) (Nippon oil and fats (Corp.) LT-221), 1.4g hexadecane trimethyl ammonium chloride (STMAC), 16g tripropylene glycol, 70g of ion-exchanged water, 0.03g of dodecyl mercaptan, 0.12g of acetic acid. 加热到60°C，并且用均质混合器进行预分散后，用超声波乳化机乳化15分钟。 After heating to 60 ° C, and pre-dispersed with a homomixer, emulsified with an ultrasonic emulsifying machine for 15 minutes. 将所述乳化液转移到300ml的四口烧瓶(带有搅拌机、冷凝管、温度计、氮气导入管)中，氮气置换后，于60°C添加0.3g的聚合引发剂偶氮二脒基丙烷.二盐酸盐，引发聚合。  The emulsion was transferred to a 300ml four-necked flask (equipped with a stirrer, a condenser, a thermometer, a nitrogen gas introducing tube), and replaced with nitrogen, at 60 ° C add 0.3g of a polymerization initiator azobis amidine propane. dihydrochloride, to initiate polymerization. 于60°C搅拌4小时后，利用GC确认单体消失，得到固形物为40%的水性分散体。 After stirring at 60 ° C 4 hours, and the disappearance of the monomer was confirmed by GC to give a solids content of 40% aqueous dispersion. 用离子交换水稀释该水性分散体，得到固形物为30%的防水防油剂组合物。 Diluted with ion-exchanged water, an aqueous dispersion having a solid of 30% water and oil repellent composition. 聚合物的组成与投入的单体组成基本一致。 Composition and monomer composition of the polymer into substantially uniform. 对防水防油剂组合物的特性进行了评价。  The properties of water and oil repellent composition were evaluated. 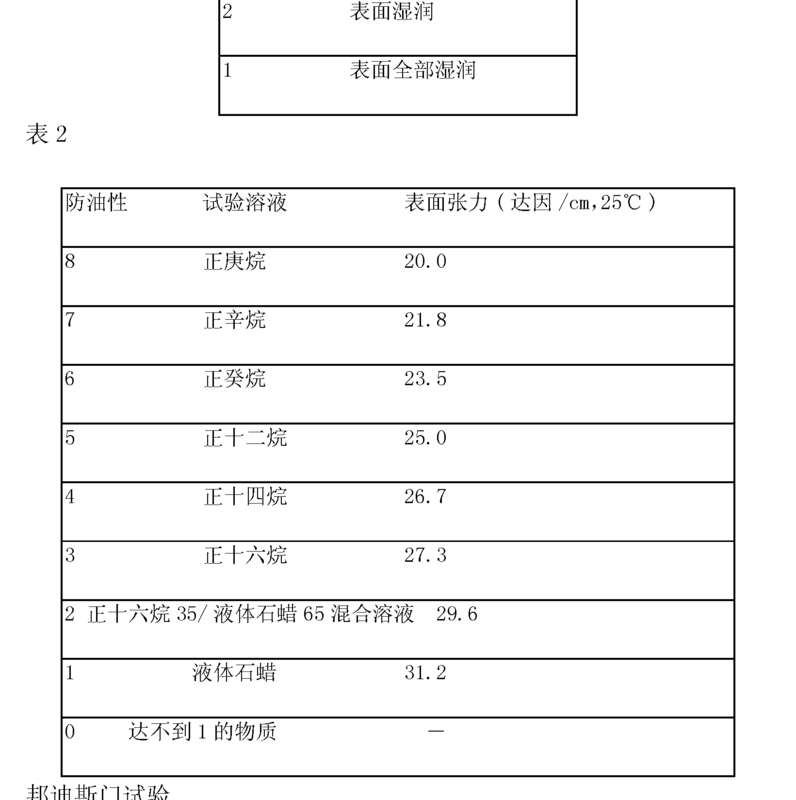 结果见表3。 The results are shown in Table 3. 以与实施例1同样的方法进行操作，区别仅在于将乳化剂的种类和量按表3所示进行变更，由此得到固形物为30%的防水防油剂组合物。  In the operation in the same manner as in Example 1, except that only the types and amount of the emulsifier is changed as shown in Table 3, thereby obtaining a solid content of 30% water and oil repellent composition. 对于所得到的组合物，评价各特性。 For the resulting composition was evaluated on various properties. 结果见表3。 The results are shown in Table 3. 投入 32.7g 的C4F9CH2CH2OCOC (CH3) =CH2 (以下记做9FMA)、20.0g 的丙烯酸硬脂酯(以下记做StA)、1.2g的N-羟甲基丙烯酰胺(以下记做N-MAM)、0.6g的甲基丙烯酸3-氯-2-羟基丙酯(以下记做CHPMA)、0.Sg的聚氧乙烯-聚氧丙烯烷基醚(非离子型表面活性剂，HLB值为9)(日本油脂(株)制造EBD-9)、3.0g的单月桂酸聚氧乙烯脱水山梨醇酯(HLB值17)(日本油脂(株)制造LT-221)、1.4g的十六烷基三甲基氯化铵、16g的三丙二醇、70g的离子交换水、0.03g的十二烷基硫醇、0.12g的醋酸。  Into 32.7g of C4F9CH2CH2OCOC (CH3) = CH2 (hereinafter denoted 9FMA), 20.0g of stearyl acrylate (hereinafter denoted StA), 1.2g of N- methylol acrylamide (hereinafter denoted N- MAM), 0.6g methacrylic acid 3-chloro-2-hydroxypropyl ester (hereinafter denoted CHPMA), polyoxyethylene 0.Sg - a polyoxypropylene alkyl ether (nonionic surfactant, HLB value 9) (Nippon oil and fats (Corp.) EBD-9), 3.0g of polyoxyethylene monolaurate sorbitan ester (HLB value 17) (Nippon oil and fats (Corp.) LT-221), 1.4g hexadecane trimethyl ammonium chloride, 16g tripropylene glycol, 70g of ion-exchanged water, 0.03g of dodecyl mercaptan, 0.12g of acetic acid. 加热到60°C，并且用均质混合器进行预分散后，用超声波乳化机乳化15分钟。 After heating to 60 ° C, and pre-dispersed with a homomixer, emulsified with an ultrasonic emulsifying machine for 15 minutes. 将所述乳化液转移到300ml的四口烧瓶(带有搅拌机、冷凝管、温度计、氮气导入管)中，氮气置换后，于60°C添加0.3g的聚合引发剂偶氮二脒基丙烷.二盐酸盐，引发聚合。  The emulsion was transferred to a 300ml four-necked flask (equipped with a stirrer, a condenser, a thermometer, a nitrogen gas introducing tube), and replaced with nitrogen, at 60 ° C add 0.3g of a polymerization initiator azobis amidine propane. dihydrochloride, to initiate polymerization. 于60°C搅拌4小时后，利用气相色谱(GC)确认单体消失，得到固形物为40%的聚合物的水性分散体。 After stirring at 60 ° C 4 hours using gas chromatography (GC) confirmed the disappearance of monomer, to obtain a 40% solids aqueous dispersion of a polymer. 用离子交换水稀释该水性分散体，得到固形物为30%的防水防油剂组合物。 Diluted with ion-exchanged water, an aqueous dispersion having a solid of 30% water and oil repellent composition. 聚合物的组成与投入的单体组成基本一致。 Composition and monomer composition of the polymer into substantially uniform. 对防水防油剂组合物的特性进行评价。  The properties of water and oil repellent composition were evaluated. 结果见表4。 The results are shown in Table 4. 以与实施例6同样的方法进行操作，区别仅在于将单体的种类和量按表4所示进行变更，由此得到固形物为30%的防水防油剂组合物。  In operation the same manner as in Example 6, except that only the kinds and amounts of monomers as shown in Table 4 is changed, thereby obtaining a solid content of 30% of the water and oil repellent composition. 对于所得到的组合物，评价各特性。 For the resulting composition was evaluated on various properties. 结果见表4。 The results are shown in Table 4. [0231 ]投入87.2g 的C4F9CH2CH2OCOC (CH3) =CH2 (以下记做9FMA)、11.3g 的丙烯酸硬脂酯(以下记做StA)、2.Sg的N-羟甲基丙烯酰胺(以下记做N-MAM)、0.7g的甲基丙烯酸3-氯-2-羟基丙酯(以下记做CHPMA)、2.1g的单棕榈酸脱水山梨醇酯(非离子型表面活性剂，HLB值7)(日本油脂(株)制造PP-40R)、2.Ig的聚氧乙烯油基醚(HLB值18)(日光化学(株)制造B0-50)、6.4g的聚氧乙烯聚氧丙烯十六烷基醚(HLB值13)(日光化学(株)制造PBC-44)、2.3g的二硬脂基二甲基氯化铵(阳离子型表面活性剂)、272.3g的离子交换水、0.5g的十二烷基硫醇、0.7g的醋酸。  Into 87.2g of C4F9CH2CH2OCOC (CH3) = CH2 (hereinafter denoted 9FMA), 11.3g of stearyl acrylate (hereinafter denoted StA), 2.Sg the N- methylol acrylamide (hereinafter denoted N -MAM), 0.7g methacrylic acid 3-chloro-2-hydroxypropyl ester (hereinafter denoted CHPMA), 2.1g of monopalmitate sorbitan esters (nonionic surfactant, HLB value 7) (Japan grease (Ltd.) PP-40R), the ethylene 2.Ig polyoxyethylene oleyl ether (HLB value 18) (Nikko Chemicals (Ltd.) B0-50), 6.4g polyoxyethylene polyoxypropylene cetyl ether (HLB value 13) (Nikko Chemicals (Co., Ltd.) PBC-44), 2.3g of distearyl dimethyl ammonium chloride (cationic surfactant), 272.3g of ion exchange water, 0.5g of ten dialkyl mercaptan, 0.7g of acetic acid. 加热到60°C，并且用均质混合器进行预分散后，用超声波乳化机乳化15分钟。 After heating to 60 ° C, and pre-dispersed with a homomixer, emulsified with an ultrasonic emulsifying machine for 15 minutes. 将所述乳化液转移到IOOOml高压釜(带有搅拌机、温度计、氮气导入管)中，氮气置换后，投入33.0g的氯乙烯。  The emulsion was transferred to IOOOml autoclave (equipped with a stirrer, a thermometer, a nitrogen gas introducing tube), and replaced with nitrogen, 33.0g of vinyl chloride into. 添加1.0g的聚合引发剂偶氮二脒基丙烷.二盐酸盐，加热到60°C后，引发聚合。 After adding 1.0g of the polymerization initiator azobis amidino propane dihydrochloride was heated to 60 ° C, to initiate polymerization. 于60°C反应4小时后，排出未反应的氯乙烯单体。  After the reaction at 60 ° C 4 hours, and discharging the unreacted vinyl chloride monomer. 氯乙烯单体的反应率为80%。 Reaction of vinyl chloride monomer was 80%. 利用GC，确认了其他单体消失，得到固形物为32%的水性分散体。 Using the GC, confirmed the disappearance of other monomers, to give a solids content of 32% aqueous dispersion. 用离子交换水稀释该水性分散体，得到固形物为30%的防水防油剂组合物。 Diluted with ion-exchanged water, an aqueous dispersion having a solid of 30% water and oil repellent composition. 对于所得到的组合物，评价各特性。  For the resulting composition was evaluated on various properties. 结果见表4。 The results are shown in Table 4. 以与实施例10同样的方法进行操作，区别仅在于将单体的种类和量按表4所示进行变更，由此得到固形物为30%的防水防油剂组合物。  In operation the same manner as in Example 10 with the exception that the kinds and amounts of monomers as shown in Table 4 is changed, thereby obtaining a solid content of 30% of the water and oil repellent composition. 对于所得到的组合物，评价各特性。 For the resulting composition was evaluated on various properties. 结果见表4。 The results are shown in Table 4. 用水稀释实施例6得到的固形物为30%的防水防油剂组合物，形成固形物为0.45%的处理浴。 Example 6 to give solid  embodiment is diluted with water to 30% water and oil repellent composition to form a 0.45% solids treatment bath. 使用该处理浴，与实施例6同样地评价防水性、防油性、邦迪斯门流出水量。 Using this treatment bath, in the same manner as in Example 6 Evaluation of water repellency, oil repellency, water flows Bundesmann. 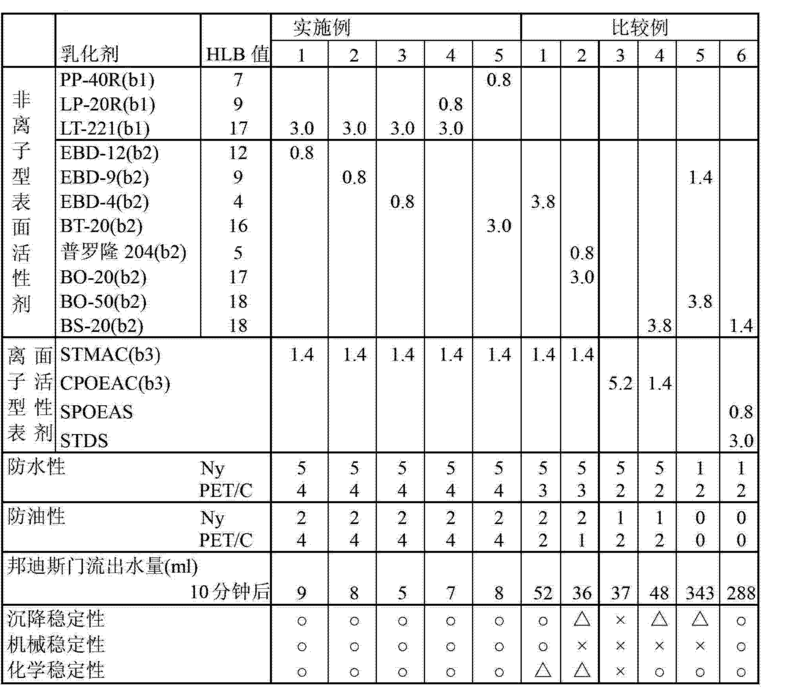 结果见表5。 The results are shown in Table 5. 用水稀释实施例6得到的固形物为30%的防水防油剂组合物，使固形物为0.45%，并在其中添加0.3%的蜜胺树脂(住友化学制造，Sumitex树脂M-3)，0.1%的催化剂(住友化学制造，Sumitex Accelerator ACX),制成处理浴。 Example 6 to give solid  embodiment is diluted with water to 30% water and oil repellent composition to a solids content of 0.45%, 0.3% and add melamine resin (manufactured by Sumitomo Chemical, and Sumitex resin M-3 ), 0.1% catalyst (manufactured by Sumitomo chemical, Sumitex Accelerator ACX), made of a treatment bath. 使用该处理浴,与实施例15同样地评价防水性、防油性、邦迪斯门流出水量。 Using this treatment bath, in the same manner as in Example 15 Evaluation of water repellency, oil repellency Bundesmann water outflow. 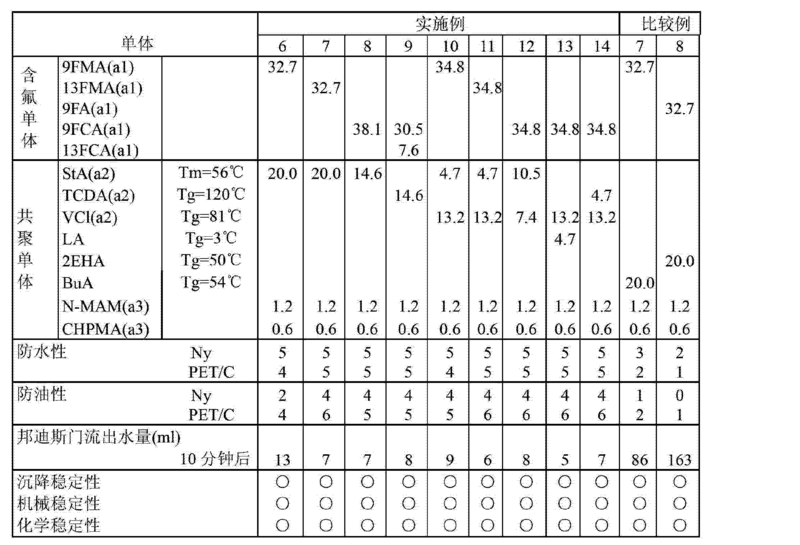 结果见表5。 The results are shown in Table 5. 用水稀释实施例6得到的固形物为30%的防水防油剂组合物，使固形物为0.45%，并在其中添加0.5%的封端化异氰酸酯交联剂(第一工业制药制造,Elastron BN-69),制成处理浴。 Example 6 to give solid  embodiment is diluted with water to 30% water and oil repellent composition to a solids content of 0.45%, 0.5% and in which blocked isocyanate crosslinking agent (manufactured by Daiichi Kogyo Seiyaku , Elastron BN-69), made of a treatment bath. 使用该处理浴，与实施例15同样地评价防水性、防油性、邦迪斯门流出水量。 Using this treatment bath, in the same manner as in Example 15 Evaluation of water repellency, oil repellency Bundesmann water outflow. 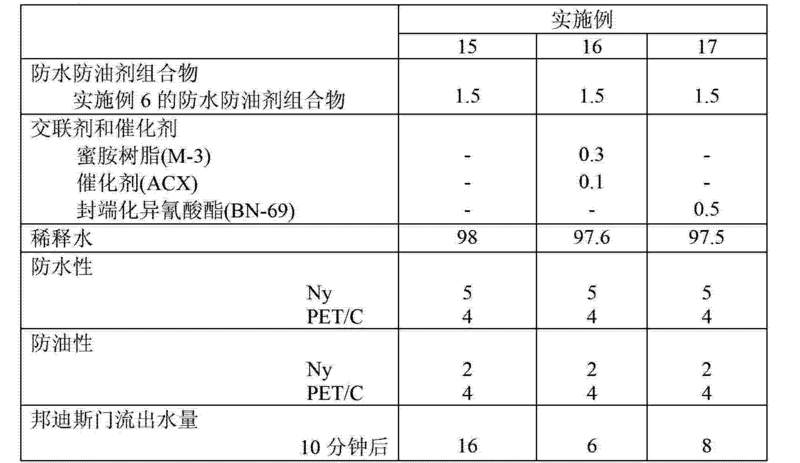 结果见表5。 The results are shown in Table 5. 1. 一种防水防油剂水性组合物，该组合物包含下述的含氟共聚物（A)、表面活性剂（B)以及水性介质（C)； 其中，所述含氟共聚物（A)包含下述聚合性单体（al)以及聚合性单体（a2)，并且根据需要还包含下述聚合性单体（a3)，所述聚合性单体（al)的量相对于该共聚物为20重量％以上； 所述（al)为具有碳原子数为I〜6的全氟代烷基或全氟代链烯基的聚合性单体；所述（a2)为能与（al)共聚的聚合性单体，其均聚物的玻璃化转变温度Tg为50°C以上并且/或者熔点Tm为30°C以上,所述（a2)以下述式（12)表示， (RA)nB 式（12) R :碳原子数为I〜30的烷基、环烷基、链烯基或环链烯基A : 二价有机基或单键B :聚合性不饱和基团η :1 或2 ; 所述（a3)为含有极性基团或反应性基团的聚合性单体，所述极性基团为选自由羟基-OH、聚氧亚烷基、氨基-NR2、N-羟甲基_NHCH2OH、酰胺基、羧基-CO A water and oil repellent aqueous composition, the composition comprising the fluorine-containing copolymer (A), the surfactant (B) and an aqueous medium (C); wherein the fluorine-containing copolymer (A ) comprising the following polymerizable monomer (Al) and the polymerizable monomer (a2), and if necessary further comprising the polymerizable monomer (a3), the amount of the polymerizable monomer (Al) relative to the copolymer was less than 20% by weight; the (Al) having a carbon number of polymerizable monomer I~6 perfluoroalkyl group or a perfluoro alkenyl group; a (a2) to be able to (Al ) copolymerizable polymerizable monomer, whose homopolymers have a glass transition temperature Tg less than 50 ° C and / or a melting point Tm of not less than 30 ° C, the (a2) represented by the following formula (12), (RA) (12) R nB formula: I~30 carbon atoms of alkyl, cycloalkyl, alkenyl or cycloalkenyl group a: a divalent organic group or a single bond B: a polymerizable unsaturated group η: 1 or 2; and the (a3) ​​a polymerizable monomer containing a polar group or reactive group, the polar group is selected from the group consisting of hydroxyl group -OH, polyoxyalkylene alkyl, amino -NR2, N- hydroxymethyl _NHCH2OH, an amide group, a carboxyl group -CO OH、卤素基团组成的组的至少一种基团，所述氨基-NR2中R是氢或碳原子数为I〜4的烷基，所述反应性基团为选自由环氧基、封端化异氰酸酯基组成的组的至少一种基团； 所述表面活性剂（B)为非离子型表面活性剂（bl)，该非离子型表面活性剂（bl)是脱水山梨醇酯和/或其环氧化物加成物； 所述水性介质（C)为仅含有水的介质，或为含有水和有机溶剂的混合物的介质。 At least one group OH, a halogen group consisting of the group, the amino group -NR2 where R is hydrogen or an alkyl group having a carbon I~4, the reactive group is selected from the group consisting of an epoxy group, a blocked terminal isocyanate group from the group consisting of at least one group; the surfactant (B) a non-ionic surfactant (bl), the nonionic surfactant (BL) is a sorbitan ester and / alkylene oxide adduct thereof; the aqueous medium (C) is a medium comprising a mixture of water and an organic solvent medium containing only water, or from. 2.如权利要求I所述的防水防油剂水性组合物，其中所述含氟共聚物（A)中，（al)的比例为40重量％〜95重量％，(a2)的比例为5重量％〜60重量％，(a3)的比例为O重量％〜15重量％。 2. The water and oil repellent aqueous composition according to claim I, wherein the fluorinated copolymer (A), the proportion of (Al) is 40 wt% ~ 95 wt%, (A2) in a proportion of 5 % ~ 60 wt% weight ratio, (a3) ​​O wt% to ~ 15% by weight. 3.如权利要求I所述的防水防油剂水性组合物，其中所述非离子型表面活性剂（bl)为选自由单月桂酸脱水山梨醇酯、单硬脂酸脱水山梨醇酯、单棕榈酸脱水山梨醇酯、单油酸脱水山梨醇酯、倍半硬脂酸脱水山梨醇酯、三硬脂酸脱水山梨醇酯、单月桂酸聚氧乙烯脱水山梨醇酯、单棕榈酸聚氧乙烯脱水山梨醇酯、单硬脂酸聚氧乙烯脱水山梨醇酯、单油酸聚氧乙烯脱水山梨醇酯和三硬脂酸聚氧乙烯脱水山梨醇酯组成的组中的至少一种表面活性剂。 3. The water and oil repellent aqueous composition according to claim I, wherein said non-ionic surfactant (BL) is selected from the group consisting of sorbitan monolaurate, sorbitan monostearate, mono sorbitan palmitate ester, sorbitan ester monooleate, sesquioleate, sorbitan monostearate, sorbitan tristearate, monolaurate polyoxyethylene sorbitan esters, polyoxyethylene monopalmitate at least one surfactant, polyoxyethylene sorbitan monostearate polyoxyethylene sorbitan monooleate, polyoxyethylene sorbitan tristearate and polyoxyethylene sorbitan esters of the group consisting of agents. 4.如权利要求I所述的防水防油剂水性组合物，其中所述表面活性剂⑶除含有非离子型表面活性剂（bl)之外，还含有（b2)脱水山梨醇酯及其环氧化物加成物以外的非离子型表面活性剂（b2)和/或阳离子型表面活性剂（b3)。 4. The water and oil repellent aqueous composition according to claim I, wherein said surfactant comprises addition ⑶ nonionic surfactant (BL), further comprising (b2) sorbitan esters and cycloalkyl nonionic surfactant other than an oxide adduct (b2) and / or cationic surfactant (b3). 5.如权利要求4所述的防水防油剂水性组合物，其中所述非离子型表面活性剂（b2)选自由直链状和/或支链状的饱和及/或不饱和脂肪族基的环氧化物加成物、直链状和/或支链状的饱和及/或不饱和脂肪酸的聚亚烷基二醇酯、聚氧乙烯（POE)/聚氧丙烯（POP)共聚物、以及乙炔二醇的环氧化物加成物组成的组。 5. The water and oil repellent aqueous composition according to claim 4, wherein the non-ionic surfactant (b2) selected from the group consisting of linear and / or branched, saturated and / or unsaturated aliphatic group epoxide adducts, linear and / or branched, saturated and / or unsaturated fatty acid polyalkylene glycol esters, polyoxyethylene (POE) / polyoxypropylene (POP) copolymer, group and acetylene glycol alkylene oxide adduct thereof. 6.如权利要求4所述的防水防油剂水性组合物，其中所述阳离子型表面活性剂（b3)是铵盐。 6. The water and oil repellent aqueous composition according to claim 4, wherein said cationic surfactant (b3) is an ammonium salt. 7.如权利要求4所述的防水防油剂水性组合物，其中所述阳离子型表面活性剂（b3)为通式R1p-N+R2qX-表示的铵盐，在通式R1p-N+R2qX +中：R1表示碳原子数为12以上的直链状和/或支链状的饱和及/或不饱和的脂肪族基， R2表示H或表示碳原子数为I〜4的烷基、苄基、聚氧亚乙基， X表示卤素、碳原子数为I〜4的脂肪酸盐基， P表示I或2, q表示2或3,且p+q=4。 7. The water and oil repellent aqueous composition according to claim 4, wherein said cationic surfactant (b3) is the formula R1p-N + R2qX- ammonium salts represented by the general formula R1p-N + R2qX + in: R1 represents a number of 12 or more carbon atoms of straight-chain and / or branched, saturated and / or unsaturated aliphatic group, R2 represents H or a C atoms I~4 alkyl, benzyl group, a polyoxyethylene, X represents a halogen, carbon atoms in the fatty acid salt I~4, P represents I or 2, q represents 2 or 3, and p + q = 4. 8.一种防水防油剂水性混合物，其含有权利要求1〜7任一项所述的防水防油剂组合物并含有交联剂。 A water and oil repellent aqueous mixture containing water and oil repellent composition as claimed in claim any one of claims 1~7 composition and a crosslinking agent. 9.一种被处理物的处理方法,该处理方法包括以权利要求1〜7中任一项所述的防水防油剂水性组合物或权利要求8所述的防水防油剂水性混合物对被处理物进行处理的步骤。 9. A method of processing thereof, the process comprising the method as claimed in any one of claims 1~7 water and oil repellent aqueous mixture of claim 8 water and oil repellent aqueous composition according to any one or the claims to be processing step of processing was performed. 10.一种被处理物，该被处理物是通过权利要求9所述的处理方法而得到的。 An object to be processed, which is to be processed by the processing method according to claim 9 obtained. 11.如权利要求1〜7任一项所述的组合物，其中，聚合性单体(al)为下述式(11-2)所示的化合物， Rf-R2-OCOCR3=CH2 式(11 — 2) Rf:碳原子数为I〜6的全氟代烷基或全氟代链烯基； R2:碳原子数为I〜10的亚烷基； R3:H、碳原子数为I〜4的烷基、或卤素。 11. The composition according to any one of claims 1~7, wherein the compound of the following formula (11-2) as shown in the polymerizable monomer (Al) is, Rf-R2-OCOCR3 = CH2 Formula (11 - 2) Rf: carbon atoms I~6 perfluoroalkyl group or a perfluoro alkenyl group; R2: alkylene group having a carbon number of I~10; R3: H, carbon atoms I~ 4 alkyl, or halogen. R:碳原子数为I〜30的烧基、环烧基、链稀基或环链稀基； R1:碳原子数为I〜20的烷基或链烯基； R2:碳原子数为I〜30的烷基、环烷基、芳香族基或卤素； R3:H、碳原子数为I〜4的烷基或卤素； R4:H、碳原子数为I〜10的烷基或环烷基。 R: burning carbon atoms I~30 group, a cycloalkyl group burning, chain or cyclic group dilute dilute group; R1: I~20 carbon atoms of an alkyl or alkenyl group; R2: carbon atoms and I ~ 30 alkyl group, a cycloalkyl group, an aromatic group, or a halogen; R3: H, I~4 carbon atoms of alkyl or halogen; R4: H, carbon atoms of the alkyl or cycloalkyl I~10 base. 13.如权利要求1〜7任一项所述的组合物，其中，聚合性单体(a2)为选自由碳原子数为15以上的烷基的(甲基)丙烯酸酯类；碳原子数为6以上的脂环式烷基或脂环式烯基的(甲基)丙烯酸酯类；氯乙烯；碳原子数为15以上的脂肪酸的乙烯基酯类；N-烷基马来亚酰胺类、甲基丙烯酸甲酯、丙烯腈、苯乙烯、烷基乙烯基醚和α-烯烃组成的组的至少一种。 13. The composition according to any one of claims 1~7, wherein the polymerizable monomer (a2) selected from the group consisting of 15 or more carbon atoms of the alkyl (meth) acrylate; carbon atoms, 6 or more aliphatic or alicyclic alkyl (meth) acrylates of cyclic alkenyl groups; vinyl; or more carbon atoms, vinyl esters of fatty acids 15; N-alkyl amides Malaya at least one of the group consisting of methyl methacrylate, acrylonitrile, styrene, alkyl vinyl ethers and α- olefins. 14.如权利要求1〜7任一项所述的组合物，其中，含有聚合性单体(a3)，并且含氟共聚物㈧是三元以上的共聚物。 14. The composition according to any one of claims 1~7, wherein, containing a polymerizable monomer (A3), and (viii) the fluorinated copolymer is a terpolymer of the above. 15.如权利要求1〜7任一项所述的组合物，其中，聚合性单体(a3)中的极性基团是羟基-OH或N-羟甲基-NHCH2OH。 15. The composition according to any one of claims 1~7, wherein the polymerizable monomer (a3) ​​in the polar group is a hydroxyl group -OH or N- methylol -NHCH2OH. 16.如权利要求I〜7任一项所述的组合物，其中，聚合性单体（a3)为选自由（甲基）丙烯酸3-氯-2-羟基丙酯、N-羟甲基（甲基）丙烯酰胺、(甲基）丙烯酸2-羟基乙酯、(甲基）丙烯酸2-羟基丙酯、氯甲基苯乙烯、（甲基）丙烯酸缩水甘油酯、双丙酮丙烯酰胺、（甲基）丙烯酸单甘油酯、（甲基）丙烯酸聚氧化烯基二醇单酯、含有封端化异氰酸酯基的（甲基）丙烯酸酯组成的组的至少一种。 16. The composition according to any I~7 claim, wherein the polymerizable monomer (a3) ​​is selected from the group consisting of (meth) acrylate, 3-chloro-2-hydroxypropyl methacrylate, N- methylol ( meth) acrylamide, (meth) acrylate, 2-hydroxyethyl (meth) acrylate, 2-hydroxypropyl acrylate, chloromethylstyrene, (meth) acrylate, diacetone acrylamide, (meth group) at least one monoglyceride acrylate, (meth) acrylate, a polyoxyalkylene glycol monoesters, comprising the blocked isocyanate group-containing (meth) acrylic acid ester group. 17.如权利要求11所述的组合物，其中，聚合性单体（al)的式（11-2)中，R3是卤素。 17. The composition according to claim 11, wherein, in the formula (11-2) polymerizable monomer (Al) is, R3 is halogen.